Tropospheric ozone (O3) is an environmental pollutant of growing concern, especially in suburban and rural areas where the density of air quality monitoring stations is not high. In this type of areas citizen science strategies can be useful tools for awareness raising, but sensor technologies must be validated before sensor data are communicated to the public. In this work, the performance under field conditions of two custom-made types of ozone sensing devices, based on metal-oxide and electrochemical sensors, was tested. A large array of 132 metal-oxide (Sensortech MICS 2614) and 11 electrochemical (Alphasense) ozone sensors, built into 44 sensing devices, was co-located at reference stations in Italy (4 stations) and Spain (5). Mean R2 between sensor and reference data was 0.88 (0.78–0.96) and 0.89 (0.73–0.96) for Captor (metal-oxide) and Raptor (electrochemical) nodes. The metal-oxide sensors showed an upper limit (approximately 170 µg/m3) implying that these sensors may be useful to communicate mean ozone concentrations but not peak episodes. The uncertainty of the nodes was 10% between 100 and 150 µg/m3 and 20% between 150 and 200 µg/m3, for Captors, and 10% for >100 µg/m3 for Raptors. Operating both types of nodes up to 5 months did not evidence any clear influence of drifts. The use of these sensors in citizen science can be a useful tool for awareness raising. However, significant data processing efforts are required to ensure high data quality, and thus machine learning strategies are advisable. Relative uncertainties should always be reported when communicating ozone concentration data from sensing nodes. Ripoll, A., Viana, M., Padrosa, M., Querol , X., Minutolo, A., Hou, K., Barceló, J., García, J. 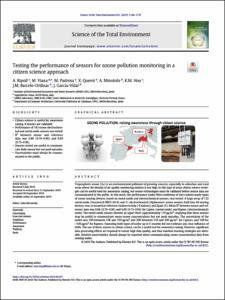 Testing the performance of sensors for ozone pollution monitoring in a citizen science approach. "Science of the total environment", 15 Febrer 2019, vol. 651, part 1, p. 1166-1179.